Today me and DD were on our own, DH headed to Star Wars celebration at the Orange County convention centre. He dropped us off at the magic kingdom drop off point at 10am and we spent the day fastpassing our way around magic kingdom. 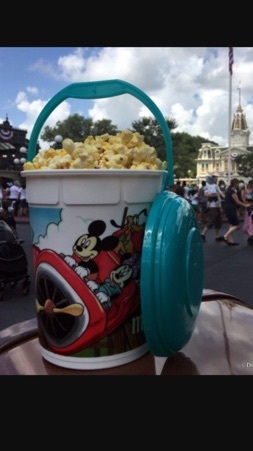 We started with 7dmt, barnstormer and teacups, we grabbed a bucked of popcorn from the stand by dumbo, this was $10 and you can have it refilled for $1.50 at any point during your stay. We then did enchanted tales with belle, dumbo and decided to have some lunch, MK was really busy and I'd managed to get a fastpass for meeting Mickey Mouse so we headed down Main Street and stopped off at Starbucks. 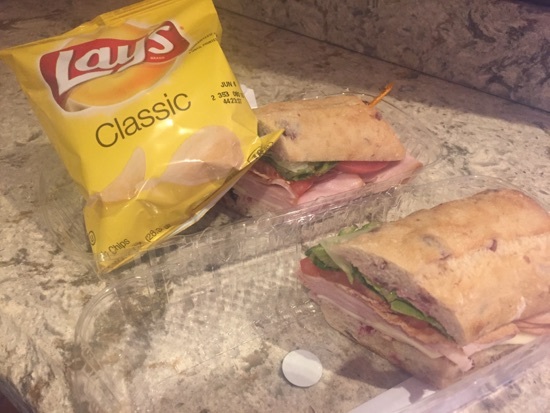 Between DD and myself we shared a turkey cranberry sandwich and some crisps, this was lovely, the cranberry was throughout the bread and gave it a sweet twist. This was more than enough to share between the two of us. 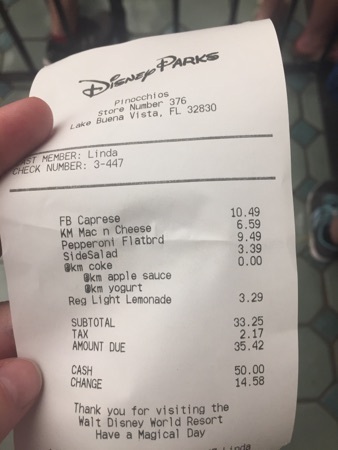 The sandwich cost $10.49, so a little on the pricey side. 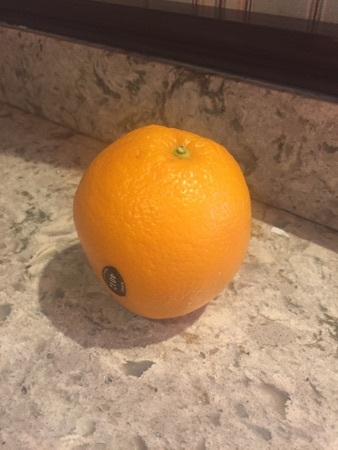 We also grabbed an orange to share but DD ate most of this. We then went off to meet Mickey Mouse and tinkerbell, I had managed to secure another fastpass for 7dmt while in the fastpass queue for Mickey Mouse but we still had abit of a wait so we headed to hadrons tavern for le fou's brew. Absolutely love these! 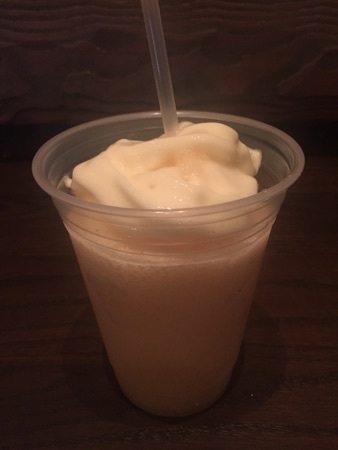 They're a frozen apple drink with a marshmallow foam. So good and really refreshing! 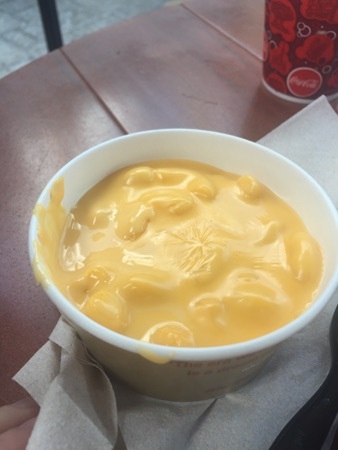 This was $5.49. After the 7dmt we met Ariel, went on the barnstormer, teacups and Winnie the Pooh and had a splash around in the Casey junior splash zone. DH contacted us to say he would meet us in MK at 5pm so we went off and met up with him and grabbed some dinner from Pinocchio village haus. DD had the kids Mac and cheese, she finished about half of this, it came with apple sauce, a bottle of yoghurt and Coke. 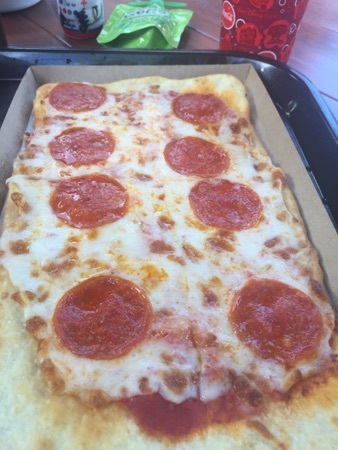 I had the pepperoni flatbread this was nice, the base was really crispy and there was plenty of topping. 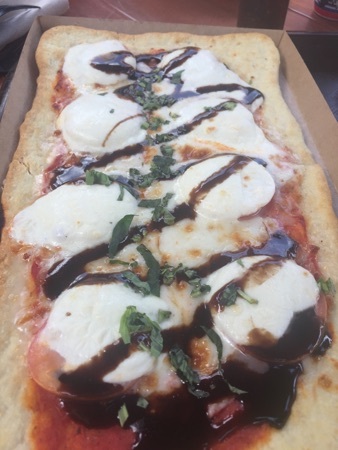 DH had the caprese flatbread, this was tomato and mozzarella drizzled with balsamic dressing. DH and I shared the flatbreads, this was by far the winner, it was really good and there was loads of topping, the balsamic dressing was really nice with the cheese and tomato. DH also got a side salad to go with it as he hadn't eaten all day. 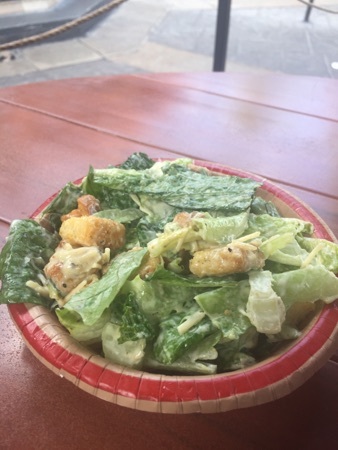 This was just a regular Caesar salad. The total came to $35.42 with a Minute Maid lemonade to share. We didn't think that was too bad for the amount and quality of the food here. After dinner we went and had a dance at the incredibles dance party in tomorrowland while waiting for our Peter Pan fastpass time, we also went on voyage of the little mermaid, the teacups and the barnstormer. We went a did the character meet with goofy and Donald and then headed over to the plaza ice cream shop to grab a sundae while waiting for our haunted mansion fastpass time. 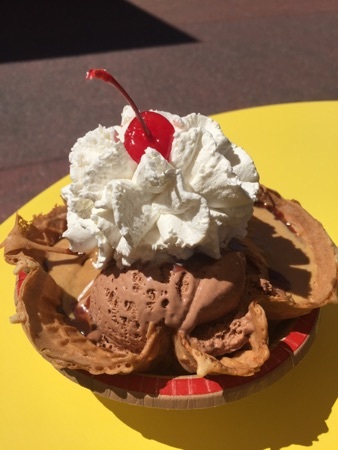 We got a plaza Sundae again, with cookies and cream and chocolate ice cream topped with fudge sauce and peanut butter drizzle. This was amazing! I love the peanut butter drizzle! The only problem is you don't get a lot when you share between 3! Might need 2 next time! This came to $6.91. We headed off and did our haunted mansion fastpass and decided it was time to head off as it was after 9pm and me and DD had been in MK for 11 hours. We got so much done though regardless of the Easter crowds. New Photo Added by missdopey - 15 Apr 17 1:07 PM. Great food and loads done. Wow! Great use of fast passes, good to see there are still plenty available after initial 3 have been used. Those flatbreads look amazing! On my list for our visit! Days until we see Mickey ..
Great day, you and your daughter got loads done today!